Renowned as a public relations guru, Michael Keith Deaver was a successful advocate of Ronald Reagan. However, he had a serious misstep not long after leaving the White House behind. Born in California in 1938, Deaver graduated from San Jose State University and went to work on the campaign of one of Ronald Reagan's competitors for the Republican nomination for Governor of California. Deaver switched teams after Reagan's nomination and worked with him during his two terms as Governor, starting in 1967. It was the start of a longtime friendship with Reagan and his wife, Nancy. After Reagan left office, Deaver continued to do public relations work on his attempts to reach the White House. He was also credited for rescuing Reagan from choking on a peanut in 1976 by administering the Heimlich maneuver. After Reagan was elected President in 1980, Deaver joined his staff as Deputy Chief of Staff. He was largely credited with setting up several successful photo ops for the President, including one atop the Great Wall of China and one where Reagan helped fill sandbags in the aftermath of a Louisiana flood. In 1985, Deaver gave May 15 as his final day of White House service, saying he intended to go on to found his own lobbying firm. Unfortunately, his reputation as an image-maker suffered a blow only weeks before his departure when he arranged for Reagan to take a trip to a military cemetery in Bitburg, Germany during a tour of Europe. The 2,000 or so graves in the cemetery included 49 members of the infamous Nazi SS and the visit provoked anger in the Jewish community. The incident did not shake the relationship between Deaver and Reagan. "I have never found any fault with anything he is doing, with his loyalty, with his friendship, and with the common sense he has always used," said Reagan. "And that extends to the arrangements for this trip, and the part that he has played in the arranging of this trip." He likened Deaver's resignation to an "amputation." Deaver's firm was met with almost instant success. His clients included CBS, Trans-World Airlines, and Philip Morris. He negotiated a $1.7 million contract with the South Korean government and associated businesses, as well as a $1.5 million contract with the Saudi Arabian government. He also lobbied for the Canadian government on the issue of acid rain. The firm collected some $3.2 million in fees in its first year, and a London-based firm offered to buy it out for $18 million. The deal never went through, as accusations about Deaver's practices started to fly. 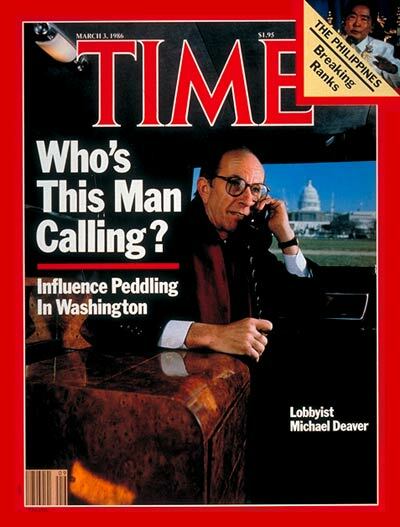 In 1986, Time published an article accusing Deaver of using his connections to the White House to boost his own success. It was revealed that Deaver retained a White House pass, as well as tennis privileges, and still received the President's confidential daily schedule (he later gave up these perks). Specifically, he was accused of violating the Ethics in Government Act of 1978, which forbids senior government officials from influencing the government where they had worked until two years after they left. Congressman John Dingell, a Michigan Democrat, called for an independent counsel investigation into Deaver's practices. Deaver readily complied, and denied any wrongdoing before Congress and a grand jury. As the investigation progressed and an indictment looked more likely, Deaver tried to get an injunction by contesting the constitutionality of the Ethics in Government Act. It didn't work, and in March of 1987 Deaver was indicted on five counts of perjury. These charged him with lying about not contacting any government officials on behalf of the Canadian and South Korean governments as well as TWA, Smith Barney Harris Upham & Company, and Puerto Rican interests. During a seven-week trial, Deaver revealed that he suffered from alcoholism and suggested that it may have blurred his memory enough to make him forget making calls to government officials. Believing the state did not have a solid case, Deaver's lawyers called none of over 200 potential witnesses they had. The gambit backfired, as the judge ruled that Deaver's alcoholism defense could not be used without backing from expert witnesses. After 27 hours of deliberation, the jury found Deaver guilty in December of 1987 on three counts of perjury (specifically, the charges related to TWA, South Korea, and Puerto Rico, where Deaver was charged with approaching Reagan's Security Adviser and trying to secure a tax break for the island). He was sentenced in 1988 to three years of probation and a $100,000 fine, and also ordered to do 1,500 hours of community service. Deaver sought to appeal the conviction, but was dealt a blow later in the year when the Supreme Court ruled 7-1 that the appointment of special prosecutors was not unconstitutional. In 1989, he dropped his attempts at appeal. Though barred from lobbying for three years after his conviction, Deaver returned to global public relations work in 1992 when he joined Edelman International. He remained close to the Reagans, even helping to coordinate the former President's funeral in 2004. For 16 years, he served on the board of the Washington substance abuse treatment center Clean and Sober Streets. He died of pancreatic cancer in 2007.